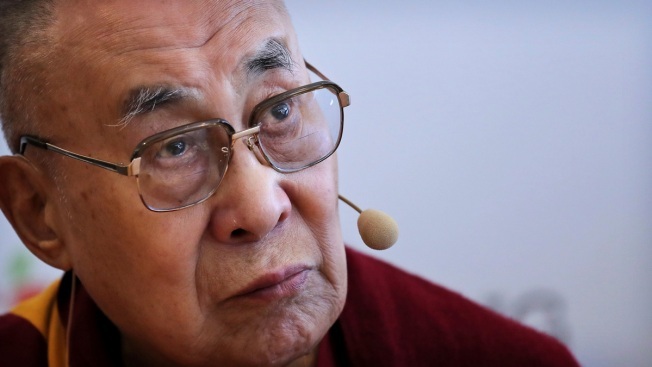 Tibetan spiritual leader the Dalai Lama listens during a press conference after talking to an audience of educators, in New Delhi, India, April 4, 2019. The Dalai Lama has been hospitalized in the Indian capital with a chest infection and is feeling better, his spokesman said Wednesday. He usually spends several months a year traveling the world to teach Buddhism and highlight the Tibetans' struggle for greater freedom in China. "Long-distance travelling is tiresome. Generally, he is in very good health. But he is taking precautions," he told The Associated Press. Answering a question related to Tibet's future with China, he reiterated that he is not seeking independence for Tibet, but would prefer a "reunion" with China under mutually acceptable terms.